You may have noticed that I’ve written about Speck products several times in the past. This is because all their products are consistently high quality, stylish, and all around pretty cool. Today I want to introduce you to their newest line of chic and protective phone cases. I’ll be showcasing a few models for the iPhone 7 and the Samsung Galaxy S7, but they have cases for other models of phone as well, all sharing the same trusted, top-notch features of the Speck brand. We’ll start with the Presidio line for the iPhone 7, which is divided into several variations of the line, like Presidio Grip, Presidio Inked, and Presidio Clear. This line is the slimmest dual-layer model they’ve made, as well as the most protective. All the Presidio cases have been lab tested from 8 or 10 feet, depending on the specific case, to ensure they all have superior drop protection. The independent labs tested for a variety of accident scenarios, like drops, extreme temperatures, cracks, bending, chemical exposure, etc. They also all feature the Impactium Shock Barrier, ridged material on the inside of the cases, which compresses on impact to absorb and disperse the shock of a fall. This Impactium is utilized in several other aspects of each Presidio case, including the raised bezel guard around the screen, to keep the glass protected while lying face up or getting dropped face down, the responsive button covers, and surrounding the microphone, speaker, camera, and port windows. Now, let’s look at the individual models in the Presidio line. the standard Presidio looks like the hard shell cases that Speck has been making for years, with that added bonus of the Impactium protection. They also come in a wide range of colors, with a scratch-resistant matte finish. The Presidio Inked is very similar, but instead of solid colors, this variation is adorned with gorgeous patterns. In place of a pattern, the Presidio Grip has the added benefit of raised rubber ridges around the edges and back of the hard shell case, to provide the extra protection of a no-slip grip. The Presidio Clear is a bit different from these listed so far. As the name would suggest, the case is made from a completely clean, custom-engineered material, which resists the yellowing influence of UV rays, so your case will remain crystal clear as long as you own it. It comes in either matte or glossy, and is also scratch-resistant. The Presidio Clear + Print may be my favorite model of the line, with all the features of the Clear, along with the added flare of multi-layered designs embedded between the hard outer and soft inner layers of the case. You get the simplicity of a see-through case, so you can still show off your sleek iPhone, but you get the little extra pop of the embedded design. Finally, the Clear + Glitter is the same as the previous Clear varieties, but with high-quality glitter crystals embedded into the hard outer layer, which won’t scratch or flake off. For those users who love their accessories to sparkle, these shimmering cases will be a big hit. Speck hasn’t left out the Samsung users, and anyone with a brand new Galaxy S7 will be very satisfied to encase their precious new beauty in one of these fantastic cases. The Candyshell line has been a staple of the Speck brand for years. Like the Presidio, it’s divided into subsets, like the Candyshell Grip, Candyshell Inked, and Candyshell Clear with Glitter. The entire Candyshell line shares a number of features across all models. They all have military grade drop protection, certified to meet military drop test standards. They have the Speck patented one-piece, multi-layered design, with a hard polycarbonate outer shell, which disperses the shock of an impact, and the softer TPE (Thermoplastic Elastomer) inner layer to absorb it. All the Candyshell models have a raised bezel screen guard, responsive button covers, and TPE surrounded port and camera windows. They also have all been lab tested for durability in extreme situations. As for the varieties of Candyshell, they come in similar styles to the Presidio line. The regular Candyshell cases come in a range of pleasing solid colors, while the Candyshell Inked come with high-res wrap-around patterns, which resist scratching and fading. The Candyshell Grip cases have raised rubber ridges for a no-slip grip, and come is 2-tone complimentary colors. The Candyshell Clear cases are made of clear, dual-layer, soft acrylic material that resists yellowing from UV rays, and the Candyshell Clear With Glitter has the added bling of embedded glitter that won’t ever rub or scratch off. Finally, you can get a Pocket-VR with Candyshell Grip case, which is a foldable, lightweight, ultra slim VR device, which comes with a Candyshell Grip case to use it with. The precision crafted lenses of the viewer are protected from dust and scratches by the retractable side panels, which are discreet enough not to get in the way of button, port, and screen access. 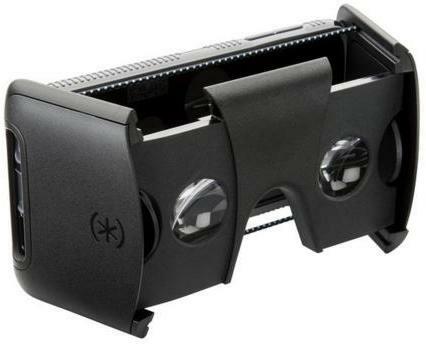 The design and lenses have been certified by Google Cardboard, to guarantee a premium VR experience. These are all fantastic cases, but like I mentioned before, this is only the tip of the iceberg. If you have a phone other than an iPhone 7 or a Samsung Galaxy S7, check out the official Speck site for the models to match your device. All Speck phone cases, and all their other products as well, are top-quality, comfortable to use, and a fun way to express your personality. Take a peak at the site and see for yourself, at www.speckproducts.com. All the above models retail between $34.95 and $44.95, and the Pocket VR retails for $69.95.